In the second pAsuram, when the friend tells parAnguSa nAyaki “even in dire situations, one should not do this [engaging in madal]” parAnguSa nAyaki reveals how she has become mentally and physically weak to sustain herself. Subsequently, parAnguSa nAyaki tells “While he stole everything of mine by manifesting his beautiful eyes and as my greatness is gone, what can the townspeople do?”. In the second pAsuram, when the friend says “at all times, we should be careful about the accusations of people” parAnguSa nAyaki says “See, I have crossed those stages of accusations” and shows her [weakened] body. (After nampiLLai explained the meanings of the first pAsuram, a SrIvaishNava arrives and requests him to explain the pravESam (introduction of the decad) and the first pAsuram” and nampiLLai mercifully obliges) There are two entry points from the previous decad into this decad; AzhwAr called out for emperumAn in thiruvAimozhi 4.7 “seelam illAch chiRiyEn“; since emperumAn did not show up even after such calling out, he said [in thiruvAimozhi 4.8 “ERALum iRaiyOnum” that] “I do not need my self and belongings which are not useful for emperumAn”; he then looked at the samsAris who did not bother about such great loss and felt bad [in thiruvAimozhi 4.9]; vowing that “I will reform these people who have been given up even by ISvara” and reformed them by instructing about bhagavAn [in thiruvAimozhi 4.10]; he then glorified bhagavAn’s mercy thinking “though I am amidst them, there is so much difference about them and I” [in thiruvAimozhi 5.1]; he performed mangaLASAsanam to the abundance of SrIvaishNavas who came about after being reformed by him [in thiruvAimozhi 5.2]; as his task was accomplished, his previous sorrow dawned again and due to great anguish, he is trying to attain emperumAn even by engaging in madal. Alternative explanation – previously, AzhwAr meditated upon emperumAn’s physical beauty in “maliyum sudar oLi mUrththi” (very radiant lord), subsequently, acquiring desire for physical togetherness with emperumAn and not having attained it, AzhwAr is trying to attain emperumAn even by engaging in madal which is forbidden. mAsaRu sOdhi – One who is having unblemished physical beauty which must be attained even by engaging in madal, smiled out of joy acquired in uniting with me, having a form which is transformed due to that union, who united with me as a benefit for him, and has the greatness where even if one dies without attaining him even after engaging in madal and can be said at that time “I engaged in madal desiring for such great emperumAn“. Should be recited as “en seyya vAy – mAsaRu sOdhi – maNik kunRaththai”. It is mercifully explained that “we explained in such a way that each adjective should be followed by an object [i.e., “seyya” (reddish) vAy (mouth), “mAsaRu” (unblemished) sOdhi (radiance), “maNi” (emerald) kunRam (mountain)). nAdiyE … – Searching for many days and being anguished and engaged in activity that is done by unwise persons – how long will we do this? The people who are determined to accuse the one who is engaged in this [bhagavAn] matter. In previous pAsuram, parAnguSa nAyaki said “what will the accusations of the people do?”; second pAsuram – when the friend said “what are you saying? whatever it may be, we should be careful about the accusations of people” parAnguSa nAyaki says “I am not saying we should ignore the accusations, but, see, I have crossed those stages of accusations”. en seyyum – what will they do? emperumAn who is having reddish lotus like beautiful eyes and is obedient towards me, fully captured me; I have lost my visibly appearing distinguished shining complexion and my body has become weak; my reddish mouth and blackish eyes have acquired a pale complexion; Oh friend! now, what will the accusations of the people do to us? By saying “nammai” (us), parAnguSa nAyaki is also including her friend who shares her pain. Saying “en seyyum Uravar kavvai thOzhi ini nammai”, parAnguSa nAyaki shows her form. The remaining pAsuram elaborates the word “ini“. The pAsuram should be recited (to get the free flow meaning) as “en seyya thAmaraik kaNNan en seyya vAyaum karum kaNNum payappUrndha – en seyyum Uravar kavvai thOzhi ini nammai“. Here, parAnguSa nAyaki is saying “nammai” (us) instead of “ennai” (me) – this is because, even though her friend is saying “we should not engage in madal” and stops her from doing so, she is also affected by the body becoming pale. It is said “Even my my friends will die before me for him”. The only difference is parAnguSa nAyaki thinks “I want him” and the friend thinks “she wants him”. Her friends are more anguished over her; the reason for this is – for parAnguSa nAyaki, the anguish is only due to being separated from her beloved lord; but for her friend the anguish is double – first, for seeing parAnguSa nAyaki suffer in separation and for not seeing the togetherness of parAnguSa nAyaki and emperumAn. SrI rAmAyaNam sundhara kANdam 35.36 “thadhASIth …” – iLaiya perumAL (lakshmaNa) informed (sugrIva) mahArAja “perumAL (SrI rAma) and pirAtti (sIthA) got separated”. As soon as he heard that, the pale complexion [indicating suffering in separation] of SrI rAma’s divine body got transferred into sugrIva’s body. As said in the same SlOkam “athyartham – nishprabha:” – perumAL only has the sorrow of being separated from pirAtti. But sugrIva’s suffering is lot more due to seeing the suffering of SrI rAma and also due to not seeing the togetherness of sIthA and SrI rAma. artham means that which can be substantiated, athyartham means that which cannot be substantiated [i.e. SrI rAma’s sorrow can be substantiated but sugrIva’s sorrow cannot be substantiated; same is applicable for parAnguSa nAyaki and her friend]. thOzhi ini nammai – says parAnguSa nAyaki. Considering the aptness as said in SrI rAmAyaNam kishkinthA kANdam 5.35 “Ekam dhu:kham sukham cha nau” (sugrIva says – Our joy and sorrow are shared). parAnguSa nAyaki is accusing her friend who is trying to stop her citing the accusations, since she too needs to abide by the principle of “Ekam dhu:kham sukham cha nau“. en seyya thAmaraik kaNNan ennai niRai koNdAn – By glancing mercifully with his cool lotus like divine eyes which are reddish due to vAthsalyam (motherly affection) saying “I and my belongings are all at your total disposal” and arriving like those who say “I and belongings are yours”, captured everything from me and left. Pretending to help me, he stole me along with the clothes I was wearing. His actions were different from his words. 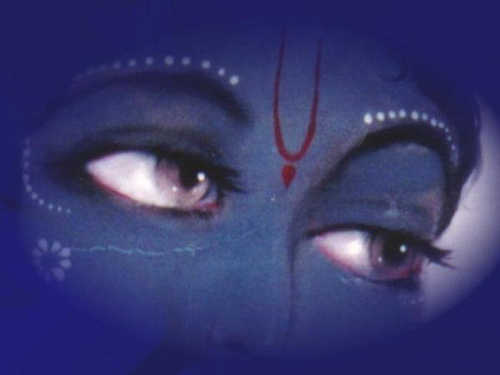 It is said in thiruvAimozhi 9.9.9 “thUdhu sey kaNgaL koNdu onRu pEsi” (speaking through his eyes which send messages). ennai niRai koNdAn – As puNdarIkAkshathvam (having lotus eyes) is the ultimate identity of his supremacy, her completeness is the ultimate identity of her femininity. As he is the purushOththama (best among male), she is nArINAmuththamai (best among female). en – Even while engaging in madal while in separation, his nature is such that when approached, we will say “he is mine”. ennai niRai koNdAn – Her pride in her completeness of femininity is such that, “Even if hundred thousand purushOththamas unite together, they can only lose to her”. en seyya thAmaraik kaNNan ennai niRai koNdAn – He captured her femininity by tricking her with changing his own masculinity. He pretended to lose and captured her. ennai niRai koNdAn – [As parAnguSa nAyaki, who never reveals her heart, revealed such sorrow, it can be understood as truth] emperumAn‘s action made parAnguSa nAyaki tell her friend “he captured me”. parAnguSa nAyaki’s completeness in femininity is such that her friend will find out about this just by observing the change in her body [paleness, weakness etc] as said in thiruvAimozhi 4.6.1 “uRRa nal nOy idhu thERinOm” (we understood your good [love] disease), and she herself will not explicitly explain that even to her friend. It is said in SrI rAmAyaNam ayOdhyA kANdam 58.35 “naiva mAm kinchith abhravIth” (sumanthra to dhaSaratha – sIthA was unable to even speak and was just weeping). niRai koNdAn – niRai – adakkam (humility). It is the concealment of internal feelings from others. He has made me to even real such internal feelings explicitly to you. Subsequent portion of the pAsuram is an explanation for “niRai koNdAn” (captured me). When asked “what did he capture from you?”, she is accounting them here. mun seyya mAmai izhandhu mEni meliveydhi en seyya vAyum karum kaNNum payppUrndha – en seyyum Uravar kavvai thOzhi ini nammai – Even if you shut my mouth from saying “I will engage in madal”, you cannot hide my form revealing the intent to engage in madal. even before emperumAn placing his hand on me, I lost the complexion which I had from the time I was born. before losing other aspects, I first lost the complexion; [like a robber] first they will grab what is visible upfront and then they will grab the money pouch; moreover, he first liked my complexion [so he captured it first]. as I was seeing – I lost my complexion. seyya mAmai – Her complexion is said as “seyya mAmai” (reddish) as well as “maNi mAmai” (blackish) – here the focus is not on the colour but on the attractive nature of the complextion. izhandhu – Having lost – since she considered the complexion which was acquired by uniting with him as a treasure, she is saying “having lost [such treasure]”. mEni meliveydhi – Now, even if he arrives or I get back the complexion, there is no abode for them to stay; only if there is a substratum, they can exist on it. As we see, it [the body] melted like ice and lost its stability. en seyya vAy … – Am I searching like an avayavi (the whole body which contains various parts) – are you not seeing that each of my limbs is withering? en seyya vAyum karum kaNNum – She is not praising her own limbs; but when he approaches, these limbs are the objects of his SrIsahasranAmam [thousand names of glorification – a term here used to indicate that emperumAn praises her limbs/features]. She would have heard those and hence she is repeating those. As she realises what she has lost, she also gets reminded what he considers dear in her. en … – Since he considered her body and limbs as his wealth, she too is taking ownership of them. Even svasvarUpam (true nature of self) is acceptable as part of prApyam (goal). If that is not the case, she would not be pursuing emperumAn since it is said in bhagavath SAsthram (SrI pAncharAthram) “dhvayaksharasthu bhavEnmruthyu:” (the two syllable word “mama” is the cause for death and the three syllable word “namama” is the cause for liberation). en seyya vAyum karum kaNNum payppUrndha – She is saying “his enjoyable food [her limbs] is being taken away”. It is said in periya thirumozhi 3.7.2 “sengani vAy nugarndhAn” (he consumed her reddish fruit like mouth) and in periya thirumozhi 8.10.1 “maNa nOkkam uNdAn” (he consumed her glance). seyya vAyum karum kaNNum payappUrndhE – As the ocean, mountains, cities etc will transform to single water body during total deluge, her whole body became pale. As poison spreads in the body, while seeing, in front of the eyes, the paleness spread abundantly. This entry was posted in thiruvAimozhi, thiruvAimozhi 5th centum on June 14, 2017 by Sarathy Thothathri.